I have heard nothing but good things about WOTOFO products. Hundreds of vapers swear by their Troll and Freakshow RTAs. I had never used a WOTOFO product until Heaven Gifts sent the relatively new Serpent 50w Kit. WOTOFO and Heaven Gifts offers both the Serpent box mod and tank as separate items, but since I received the complete kit that’s how I’ll review it, as a kit. 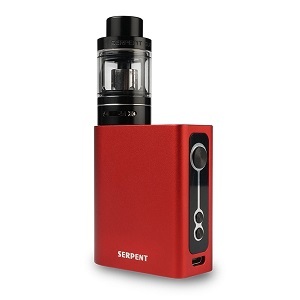 The Serpent has a wattage range of 7 – 50 watts with adjustments in 0.1 watt increments. It’s also a temperature control device with a temperature range of 200° – 600° F with adjustments in 10° increments, and 100° – 315° C with adjustments in 5° increments. To switch from one temperature scale to the other simply scroll to the top or bottom of one to get to the other. Adjust temperature or wattage with the up and down buttons. 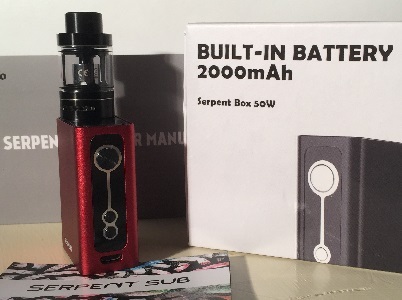 Powered by an internal 2000 mAh battery, the Serpent 50w mod will fire coils with a resistance range of 0.1 – 1.0 ohm in temperature control mode and 0.1 – 3.0 ohm in variable wattage mode. There are three buttons on the front of the Serpent, the fire button and the up and down buttons. The display is located on top of the mod in front of the 510 connector. To turn the device on or off, press the fire button five times. To switch between power modes hold in the fire button and the up button at the same time. This will display the menu with options for wattage mode and three temperature control modes, Nickel, Titanium and Stainless Steel. Use the up and down buttons to highlight your choice of modes and press the fire button to select it. Once you’ve found a wattage or temperature setting that suits you, you can lock it in by pressing both the up and down buttons at the same time. The display will read “Key Lock” and you won’t be able to adjust wattage or temperature unless you unlock the setting by again holding in the up and down buttons. When you’ve attached a new coil to the Serpent you’ll be prompted to set the base resistance. The display will read, “Select Coil: New/Old”, use the up and down buttons to select an option and press the fire button to select it. This should be done with the coil at room temperature. 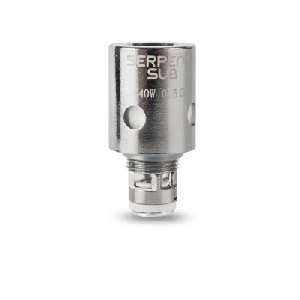 The Serpent Sub Tank is top filling with a 3.5 ml capacity. To fill the tank, simply unscrew the top cap and fill with ejuice. A 0.5 ohm SSOCC coil comes installed in the tank, with a spare in the box that also holds the micro USB cable. WOTOFO has etched the resistance and suggested max wattage, 40 watts, on the base of each coil. 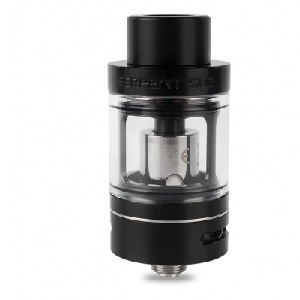 The Serpent Sub Tank is compatible with Kanger OCC and SSOCC coils. To replace a coil unscrew the base of the tank, unscrew the old coil and insert a new one. Before vaping with a new coil, prime it by dripping a few drops of ejuice into the center of the coil and on the cotton visible through the ejuice ports on the side of the coil. Re-attach the base of tank and fill it with ejuice. With a new coil be sure to allow it soak in the ejuice for a few minutes before vaping. The airflow on the Serpent Sub Tank is adjustable by rotating the collar at the base of the tank. Any mod, any tank is ultimately only as good as the coil attached to them. All of the components that make up the Serpent kit perform admirably. The mod fires when you hit the button, and all of the buttons function easily and are simple to reach and operate. The threading on the tank is smooth and I haven’t experienced any leakage issues. And those SSOCC coils provide more than adequate amounts of vapor that is very pure and tasty. The internal 2000 mAh battery doesn’t take very long to fully charge. And while it isn’t exactly enormous, I have been getting a full work day of vaping out of it between charges. Most of the features packed into the WOTOFO Serpent 50w Kit are solid. The mod will fire Stainless Steel, Nickel and Titanium coils in temperature control mode. The tank has a healthy 3.5 ml capacity and its top fill set up keeps things neat. That fact that it’s compatible with Kangertech SSOCC coils is a big plus. There are two minor areas where the features are less than stellar. The first is a pet peeve of mine, temperature adjustments that aren’t in single degree increments. 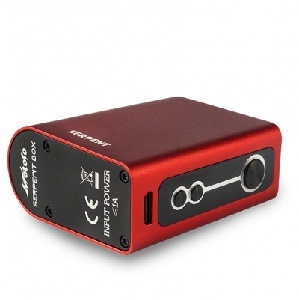 The second is the mod’s relatively low maximum wattage output of 50 watts. But neither of those should be viewed as deal breakers. WOTOFO is known for its high quality products, and the Serpent 50w kit is no different. Overall construction is solid. All of the threading is smooth and the components all fit together snugly. The display is sharp, bright and easy to read. And the buttons are easy to reach and nearly flush with the body of the mod, making it difficult to press them in accidentally. This is a compact, even tiny kit, which adds to its good looks. The finish is rich with deep colors and the logo, while subdued, really pops. WOTOFO offers the Serpent 50w mod in red, green, blue, silver and black. The tank comes in black. WOTOFO has the Serpent 50w Complete Kit listed at $79.99,which isn’t terrible for a kit like this. Heaven Gifts, who supplied the Serpent for review, has it available for $61.80,which makes this a pretty good deal. I’ve been vaping with the WOTOFO Serpent 50w Complete Kit for a little over a week, with several different flavors of ejuice. Where this package really shines is where it really matters, vapor and flavor production. It makes a great kit for someone just starting to vape who wants a little more robust experience than your typical beginner kits. And it would make an excellent second device for experienced vapers who want something inexpensive that still has most of the features and performance of their primary device. Heaven Gifts provided the WOTOFO Serpent 50w Complete Kit for the purpose of this review. Order the WOTOFO Serpent 50w Kit from Heaven Gifts.